An expensive, ornate vase can be as much of a centerpiece as the flowers that are in it. These floating vases designed by the Japanese group oodesign take things in the opposite direction by making them look like water ripples. The vases themselves are just discs of clear plastic, but the design idea behind them is elegantly simple. 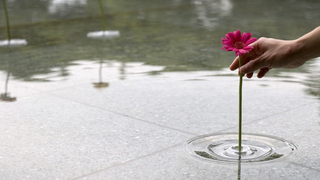 Intended to look like ripples of water, the discs will float in any body of water (or whathaveyou) you put them in, and let a single flower balance delicately inside of it, with the stem poking out the bottom. The result is what seems—at a glance, at least—to be straight-up magic.